Before purchasing a modified shipping container, it’s important to understand the costs, benefits, and limitations of conex containers compared to traditional modular structures. So Falcon created a 30-minute webinar and comprehensive guide to help you make an informed decision. Our “What You MUST Know Before Buying a Shipping Container Structure” webinar and guide take a deep dive into the research, evaluation, cost analysis, and purchasing processes involved. Learn how shipping containers revolutionized the shipping industry, resolved a theft problem on industrial job sites, and evolved into the widely accepted building structure solutions they provide today. 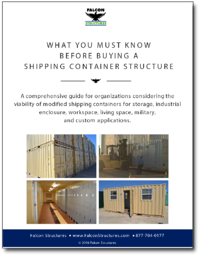 This section covers the benefits of manufacturing modified shipping containers offsite compared to the limitations of building structures on a jobsite. You’ll learn how ease of deployment and relocation, durability and stackability, and one-stop-project management give modular manufacturing the edge. One of the biggest misconceptions about ISO shipping containers is that they are really inexpensive. In this section, we explain how to estimate shipping container project costs upfront and evaluate the total cost of ownership. Before buying a conex container, there are several technical considerations to ponder first. Structure foundations, shipping container sizes, weather conditions, personnel usage, container delivery, and utility requirements are covered here. In this section, we explain why high-end finishes like granite and marble and creative, complex ideas can be costly and unsafe. You’ll learn why relying on an experienced team of designers and engineers is essential when thinking through and building shipping container structures. Codes and permits in the shipping container structure industry vary from state to state and city to city. Check out this section before purchasing an ISO shipping container structure, otherwise you could sink money into a project that may not fly with local authorities. 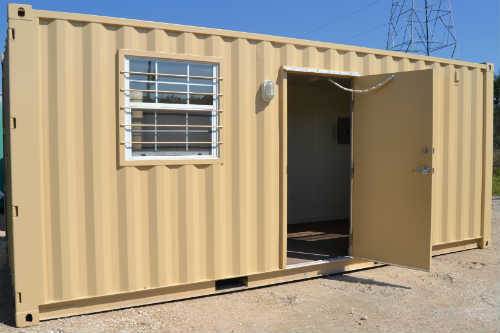 Shipping containers provide the ideal solution for many storage, industrial, manufacturing, military, workspace, and living space needs – but Conex containers don’t suit every application. Without extensive – and expensive – modifications you could end up with an unsafe structure that puts inhabitants at risk. Whether modifying shipping containers is a new concept to you, or you’ve kicked the tires for awhile, Falcon’s comprehensive guide and webinar provide essential information you MUST know prior to purchase. You can also turn to Falcon’s experienced design and engineering team for advice. Since 2003, the Falcon team has been modifying shipping containers for applications big and small. Safety is also a top priority here, so you can rely on us to discuss all your options and build a structure that's safe. If you would like to learn more about shipping containers and whether a Conex container would suit your application, we’re here to help! Just give us a call at 877-704-0177.